This PDF 1.5 document has been generated by Microsoft® Word 2010, and has been sent on pdf-archive.com on 28/01/2014 at 16:30, from IP address 41.72.x.x. The current document download page has been viewed 1246 times. File size: 512 KB (9 pages). successful season. Please see the detailed information attached if you, or someone you know, is interested. Shop on Cairo Rd (next to Jubliee Chemist, opposite Farmers House). PLEASE NOTE THAT THE REGISTRATION DEADLINE IS FEBRUARY 28th 2014.
with participants from all over Lusaka. 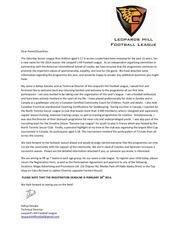 all players, parents, coaches, and referees that outline our commitment to equality, fair play and sportsmanship. certificate and overall winning teams will receive a trophy. occur. Players will be contacted by email to confirm their alternate game time/date. players’ safety. Strictly no jewellery may be worn. registration packets. 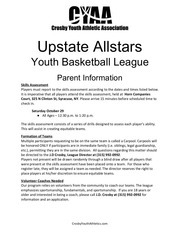 Packets will include team assignment, uniform, participant handbook and game schedule. player, such as booing, taunting or using profane language or gestures. or coaches at the field; and will speak with coaches privately regarding any concerns. expressing positive support for all players, coaches and officials. • I / we will teach children to play by the rules, and to resolve conflicts without resorting to hostility. I HAVE READ, UNDERSTAND AND AGREE TO ALL OF THE ABOVE TERMS AND CONDITIONS. child’s team, at times, there could be additional coaches needed for teams on which your child is not playing. program and continue to make it accessible to all young players within our community. 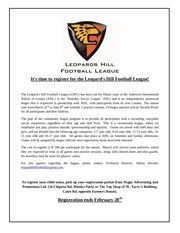 more details, please contact the league Technical Director, Aditya Devalia (leopardshillfootball@gmail.com). uniforms for the sponsored team. 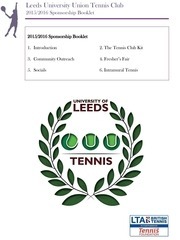 Sponsorship value: K 900 per team. the cost of field lining and equipment purchases/repairs. 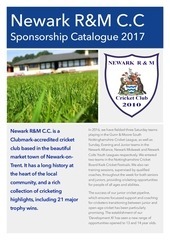 Sponsorship value K 2000 per field for the season. referees’ salary. Sponsorship value: K7,500. participation, they must be bussed in to and from the field every week. Sponsorship value: K 18,000.
referees at the end of the league. Sponsorship value: TBD. 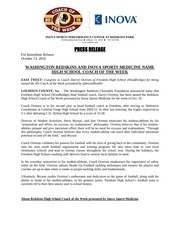 season to take team photographs and capture important game memories. Sponsorship value: TBD. Media Sponsor – One or multiple sponsors. For periodic coverage of the season. Sponsorship value: TBD. distributed to community outreach programs. Sponsorship value: TBD. vegetables, fruit and wholesome foods to be sponsored for this event. Sponsorship value: TBD. This file has been shared by a user of PDF Archive. Document ID: 00144144.